Out front, a walk-up fish-’n’-chips-’n’-chowder bar faces Northlake Way. Inside, Ivar’s Salmon House is a beautiful cedar replica of a Pacific Northwest longhouse, decorated with native artifacts. 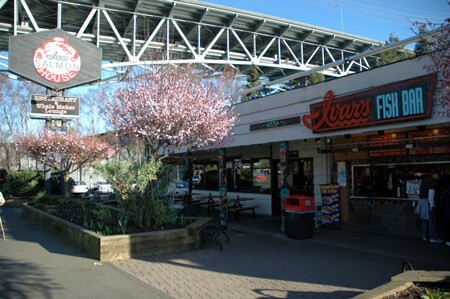 Ivar’s doesn’t make the best seafood in the city, but it’s a Northwest icon. Hours: Mon-Sat 11 am-11 pm, Sun 3:30-11 pm. Happy Hour Daily 3 pm-close ($5-$7 small bites, $7-$12 shareables, $9-$20 big bites, $9-$12 cocktails, $6 draft beer and cider, $5.50-$6 bottled beer, $6 non alcoholic drinks).